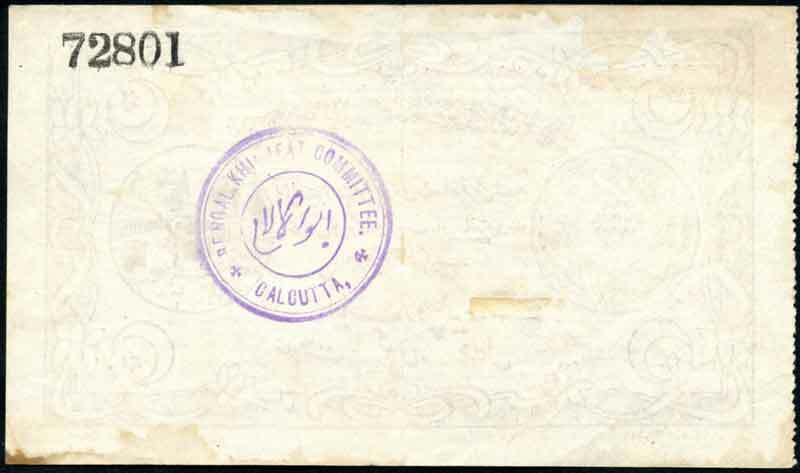 Although the images depicted here have an appearance of a banknote, they are the front and back of a one-rupee receipt issued in 1920 by the Khilafat Committee in Calcutta. Because it is not always understood this is a receipt for a donation, examples of the receipt are occasionally found in bank note dealers’ stock, as they can be mistaken as a local currency issue. They are particularly confusing to collectors as the text on the notes appears to be Arabic and the image of the Ka’aba within the Holy Mosque in Mecca suggest the receipts originate from the Arab world. In fact, the text on the notes is written in English, Arabic and Urdu, and the receipts are entirely of Indian origin. The Khilafat Movement arose in India amongst the Muslim population in the period after World War I. There were two principal drivers to the movement – support for the reinstatement of a Caliph and a desire to protest against the British occupation of India. In some ways the objectives were intertwined. With the defeat of the Ottoman Empire in the First World War, the British had broken the empire which supported the Caliph, who had been the Ottoman Sultan. Muslims who supported the Caliph believed the British had disrupted the leadership of the Muslim people by their victory. Strong support for the Ottoman Empire in India was stimulated in the late nineteenth century by the Sultans of Turkey, who promoted a pan-Islamic movement and who were also struggling to suppress western democratic movements in Turkey. Muslims in India largely supported the Sultan, so when Turkey joined Germany against the British and her allies, there developed a degree of anti-British feeling among the Indian Muslims. With the defeat of Turkey in 1918 and the subsequent abolition of the sultanate in 1922 by the Turks under Kemal Atatürk, Indian Muslims created the Khilafat Movement under the leadership of brothers Shaukat Ali and Mohammad Ali, with the objective to re-establish the Caliphate. The Khilafat Movement received support from Mahatma Gandhi who promoted an anti-British policy after World War I; as he and many Indians were incredibly disappointed the British did not commence guiding India down the path of independence after the War, following India’s enormous support during the Great War. India had supplied almost one million soldiers to the war effort, millions of pounds in sterling, and countless supplies of wheat, steel and shipping. When Britain continued to repress Indians in the post-war period, Gandhi called for all Indians to boycott British products and a period of civil disobedience commenced. In an effort to encompass all Indians, the Khilafat Movement was supported by Gandhi. After a number of years, opposition to the British faded and in 1924 the Turks abolished the position of the Caliph. Although other reasons contributed to the disintegration of the Khilafat Movement, from the time the position of Caliph was abolished the decline of the Khilafat Movement was rapid. The text on the banknote is of some interest. At the very top in the centre of the note, is the number 786 in Urdu or Arabic numerals. This number represents the Arabic phrase ‘Bismillah-ir-Rahman-ir-Rahim’ which is usually translated as ‘In the name of God, most Gracious, most Compassionate’. Arabic letters have a numeric value and when the letters of the phrase are added up using their numeric value, they come to 786. The curved line is in Arabic and it is a verse from Holy Qur'an which encourages spending money in good ways. A translation is: ‘Who is he that will lend to Allah a goodly loan, then Allah will increase it twice fold to his credit, and he will have (as well) a reward’. The next three lines repeat the verse from the Qur’an in Urdu. The next two words in bold text state: ‘One rupee’. Below this are three words which state ‘Khilafat Committee Bengal’, below which in small text is ‘Calcutta’. 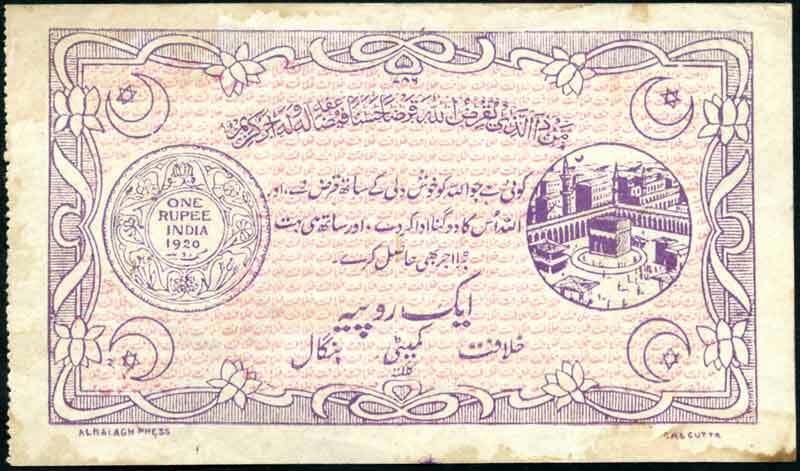 The receipt of one rupee illustrated here, issued by the Calcutta Bengal Khilafat Committee, is a simple reminder of a short-lived movement in India nearly a century ago. Although the author has only ever seen one-rupee receipts, other denominations might exist. If you come across one, don’t collect it as a banknote, but buy it and put it to one side as an historic relic. Thanks to Yahya Qureshi and Haider Saffar for their translations of text on the receipt. Transliterating from the Arabic can be problematic and the Arabic for this phrase can also be written as ‘Bismillah al rahman al rahim’ or ‘Bismillahi al rahman al rahim’.